phnom kulen, Siem Reap pro­vince – As a child growing up in Cambodia, Kaven Lee heard stories about a sacred mountain with waterfalls called Phnom Kulen. He dreamed of visiting one day. But after surviving the killing fields in the 1970s, Lee found himself instead making a life in the US. Last month, he finally returned to Cambodia and, as a tourist, achieved a lifelong dream. That is changing, and quickly. In the wake of Khmer Rouge defections and land-mine clearance, Phnom Kulen has opened up within the past several months as a popular day trip for local and international tourists alike. A Ministry of Environment film crew recently visited the area to shoot a 30-minute documentary, which will be shown soon on state-run TVK. A karaoke video shot at the waterfalls will air on an upcoming segment of the ministry’s popular environmental quiz show. But like many of Cambodia’s 23 protected areas, Phnom Kulen faces a myriad of challenges. Road conditions to the area, some 50 km northeast of Siem Reap town, are poor. Guards informally collect fees at the base of the trail. And, most seriously, logging and development threaten the scenic area. In June, top government officials approved a 2,400-hectare development contract to Military Region 4, according to documents obtained by The Cam­bodia Daily. The contract is in apparent violation of law. By royal decree, the 37,500-hectare Phnom Kulen is to be protected for scientific, educational and recreational purposes. Acting Conservation Director Chay Samith said this week that the Ministry of Environment will ask the Council of Ministers to reconsider the military concession in order to protect the historical site for eco-tourism and cultural tourism. On a recent day, it took two hours by mud-rutted road from Siem Reap town to reach the base of Phnom Kulen. During the two-hour hike to the top of the nearly 500-meter mountain, two Cambodians with chain saws slung over their shoulders emerged from the forest. The buzz of another chains could be heard in the distance, and a lowland section of the area had been stripped of trees. On the side trail leading to the waterfalls, a red land-mine sign warned visitors not to stray from the path; the waterfalls themselves were littered with white plastic containers floating like mini-rafts. But the beauty of Phnom Kulen was undeniable. The area is a refuge from the hubbub of Phnom Penh, offering a pleasant hike among towering trees and fluttering yellow butterflies and a refreshing wade in the river among underwater Angkorean-era stone carvings. And then there are the two favorite attractions for local tourists: dramatic waterfalls and a makeshift mountaintop temple with a reclining Buddha perched atop a rock. History has it that in AD 802 King Jayavarman II declared Cambodia independent from Java in a ceremony on Phnom Kulen. Ever since, the site has been characterized as the foundation of Angkor civilization, a sacred sanctuary and even the source of Khmer identity. The site of greatest historical interest is the river of 1,000 lingas, rediscovered in 1968, and marked by underwater stone carvings. A linga generally is a vertically-cut stone set within other stones and found in sacred places. At the height of the Angkorean empire, the lingas represented the es­sence of devaraja, or god-king. Priests would pour water over the cylinders in a ritual to bring fertility to the region. So Mara said Phnom Kulen opened up for tourism only about four months ago, after the area was cleared of land mines and the Khmer Rouge. The Ministry of Tourism hasn’t yet established a formal entrance fee, but government officials widely acknowledge the existence of an informal one. Tourists are “asked to pay a contribution, a charity to the soldiers, former KR, who provide security,” said So Mara. 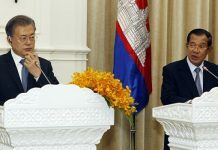 The fee generally runs 500 to 1,000 riel for Cambodians, al­though Lao Mong Hay said he paid 10,000 riel and foreigners have been charged up to $50. An American expatriate who visited the area last week said his group talked a guard down from $30 to $12. The man escorted the group up the mountain. 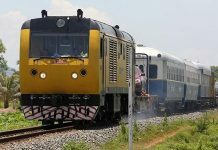 Getting to Phnom Kulen from Siem Reap also can be an adventure. Garella reported that his taxi lost a side-view mirror to an ox cart and had to be pushed out of a rice paddy after veering off the pot-holed road. A van carrying visitors recently sprung a leak in the radiator, patched by the driver with mashed bananas before the return home. The ingenuity produced limited success—the radiator had to be refilled every 20 minutes as the van limped home. Besides the military concession, rumors persist that the Phnom Kulen area is being targeted for a casino and hotel complex and tourist road. 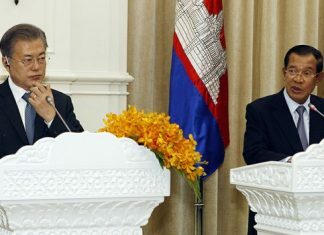 Environment Minister Mok Mareth said he did not know of any such development plans, nor did Sok Chenda, secretary-general of the Council for the Development of Cambodia. Lao Mong Hay agreed, saying that the remoteness and challenge of the hike are all part of Phnom Kulen’s charm. “To go to heaven, you have to make some sacrifices,” he said.